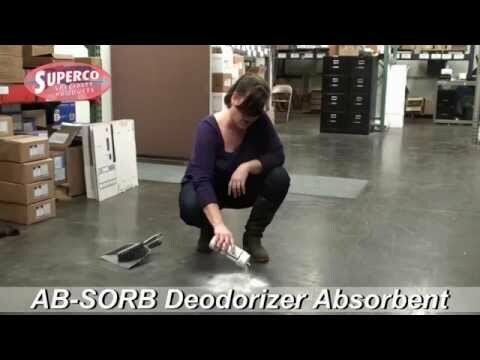 Super-Absorbent Deodorizer specifically formulated to absorb, solidify & deodorize potentially hazardous liquids and spills. Use for blood, urine, vomit and chemical spills. 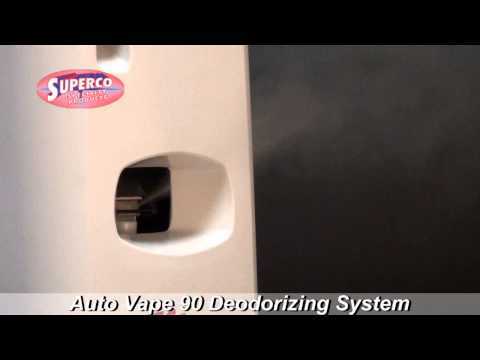 AUTO VAPE-90 is the world's first 90 day vapor based room deodorizer system. This innovative new type of automatic room deodorizer uses the latest Vapor technology to deliver powerful and effective odor control to restrooms, storage closets, common areas and public areas where odors can be a problem. AUTO VAPE-90 uses no metal cans, no propellants, no isobutane and less packaging giving this product a reduced carbon footprint.. Use with AV-90 Fully programmable dispenser. SUPER 21 is a complete urinal maintenance system in a disposable one-piece unit. Each time the fixture is flushed, a pre-measured amount of chemical compounds, enzymes and powerful cleansers are released that descale, de-lime, prevent bacteria growth, deodorize and maintain the fixture and drain lines. SUPER 21 attacks urinal odors in two ways: by removing the source of the odor, uratic salts that accumulate in the drain, and by dispensing a mild pleasant scent. SUPER 21 also helps keep the drain lines clear and free flowing by depositing a micro-thin coating that seals and protects, and by releasing an enzyme that digests organic materials. 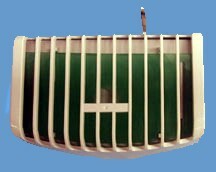 SUPER 21 lasts an average of 30 days, under normal conditions, due to its unique design that protects the chemical block from excessive erosion caused by rushing water as well as debris dropped into the fixture. CONTROL II MINT is one product that does many jobs. Use CONTROL II MINT to control odors anywhere, even odors due to pet urine that has soaked into carpeting or wood flooring. Use CONTROL II MINT on a preventative maintenance schedule to keep drain lines flowing freely. CONTROL II MINT really works, use in urinals, toilets, or in mop water to get a handle on uncontrollable restroom odors. 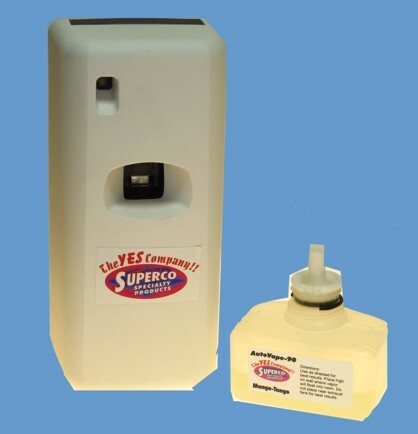 For maximum results, ask your SUPERCO representative about our "Knight Watch" dispensing system for automatic maintenance of your drains or deodorizing of your trash chutes and dumpsters. Our automatic system saves labor plus eliminates wasted product due to over use. DE-SCALE removes discoloration caused by rust, scale, mineral deposits, algae and sloppy cement patchwork. This product is popular with ready-mix concrete companies who use it to clean the mixers, trucks, trailers and other areas that get splashed with cement. Another common use for DE-SCALE is to remove rust stains, caused by leaking automobile radiators, from parking areas, sidewalks and maintenance shop floors. DE-SCALE lightly etches concrete and is the ideal product to prep concrete for painting. Use this product to clean exterior concrete stairs that tend to get slippery in wet weather. After cleaning, DE-SCALE will leave the surface slightly more aggressive and provide a safer surface to walk on. DRAIN DRAGON is a special blend of enzymes, detergents and deodorizers containing aerobic and anaerobic bacteria. DRAIN DRAGON's thickened formula clings to the side of pipes and lines increasing effectiveness. DRAIN DRAGON eliminates odors at the source and through a digestive process, liquefies organic waste such as fat, grease, protein and carbohydrates. (Quarts). DRAIN GUARDIAN is a new and advanced drain conditioning system that lasts up to 45 days. DRAIN GUARDIAN's an all natural, eco-friendly solid composition that contains a combination of enzymes. DRAIN GUARDIAN will eliminate problematic fruit flies, and will keep drains clear from fats, greases, mold & mildew, that can clog your drain lines. DRAIN GUARDIAN's fresh scent will remove any foul odors. 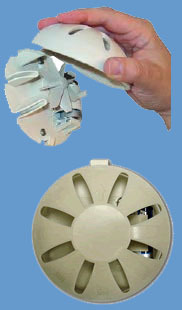 DRAIN GUARDIAN is easy to install, and requires minimal maintenance. DUZ-IT-ALL easily removes Graffiti, Dirt, Grime, Indelible Ink, Permanent Marker, Rust, Iron, Calcium Build-Up, Scale, etc. from Restroom Partitions, Desks, Lockers, Walls, Bus and Vehicle Vinyl Seats. DUZ-IT-ALL can be used on Enamel Surfaces, Metal, Chrome, Brass, Stainless Steel, Aluminum, Tile, Vinyl, Formica, Rubber, Painted Wood, Glass, and Cement. DUZ-IT-ALL is an excellent cleaner for non-porous, enameled, and painted surfaces. DUZ-IT-ALL is easy to use, and cleans and polishes in one step. 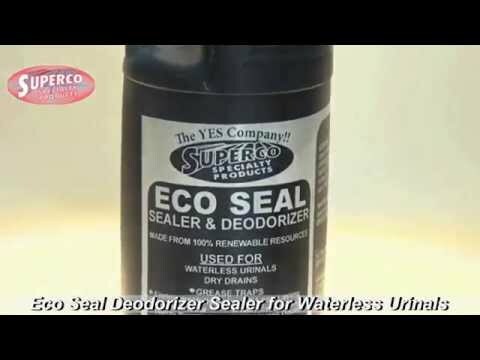 ECO SEAL is a uniquely formulated, environmentally friendly sealer designed for use in waterless no flush urinals. ECO SEAL creates a non-soluble seal of a deodorizing liquid in the trap. ECO SEAL also prevents unwanted sewer vapors from backing their way into the air. ECO SEAL has a pleasant cherry fragrance to give instant and long lasting odor control from dried out traps, keeping them wet and odor free. Easy to use, simply add it and forget it. ELECTRO-MIST Earth Friendly Odor Neutralizer is an aerosol product used in an automatic metered dispenser for continuous odor control in restrooms, trash chutes, laundry rooms, storage areas, apartment complexes, schools, hotels, offices, municipalities, etc. ELECTRO-MIST deodorants are the original, oxidizing formulas which are often copied but never equaled. These formulas revolutionized the odor control industry with their effectiveness. 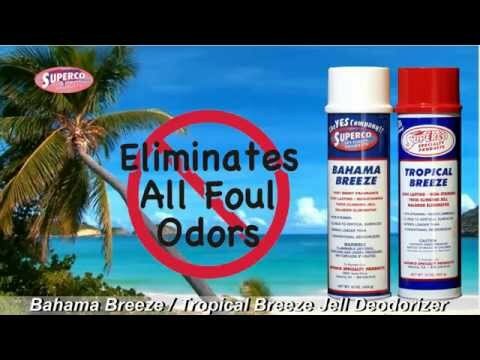 They do not simply cover-up one odor with another and they do not deaden the sense of smell. ELECTRO-MIST actually neutralizes offensive odors. FRAGRANCE BEADS are a new concept in air fresheners. 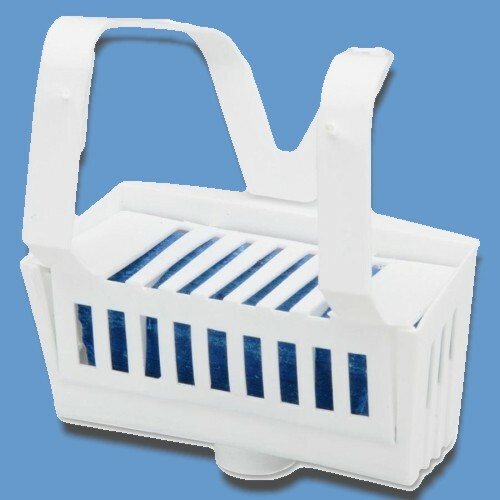 These compact bags can refresh an entire room or office in minutes utilizing the air conditioning or heating system already in use at your facility. This remarkable new technology counteracts foul odors in minutes and replaces them with clean, fresh air and a pleasant fragrance that last for up to 30 days. 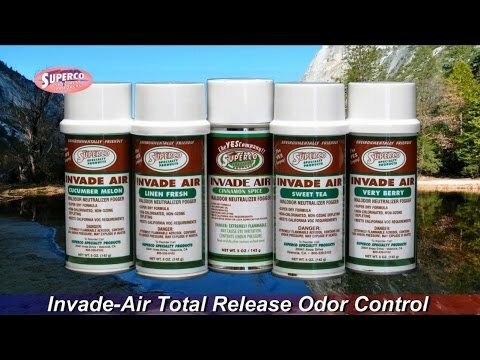 INVADE AIR Total Release Malodor Counteractants are designed to eliminate odors in a large area by releasing a volume of product that eliminates airborne odors as well as odors embedded into walls, carpet, ceiling tiles, drapery, upholstery, etc. INVADE AIR is a high powered, fine mist, total release fogger that will penetrate and chemically neutralize malodors at the source. 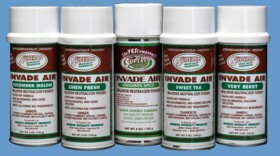 INVADE AIR SPICE has a delightful cinnamon scent, INVADE LINEN FRESH has a fresh clean scent while VERY BERRY, CUCUMBER MELON AND SWEET TEA are fresh and sweet. Lavender scented LAVULOSO cleans, deodorizes and degreases in one step. It is specially formulated with all natural ingredients which are safe to the environment but have the extra punch for the toughest cleaning jobs. PHENOMENAL is an effective disinfectant for hard surfaces for general hospital use, schools, medical, dental and business offices, sickrooms, nursing homes and ambulances. This product will control the following organisms: Salmonella choleraesuis, Staphylococcus aureus, Trichophyton mentagrophytes, Pseudomonas aeruginosa, Streptococcus pyogenes, HIV-1 (associated with AIDS) and tubercle bacilli. † PHENOMENAL will control mildew growth on fabric for 14 days and on hard surfaces for 21 days. 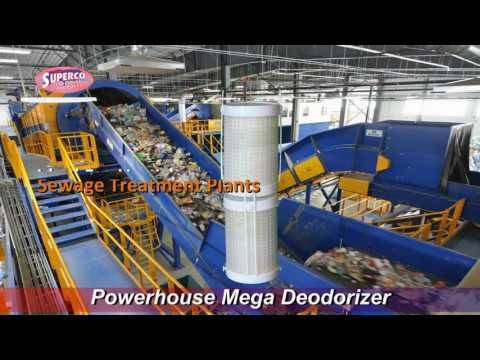 POWERHOUSE MEGA helps control big odors that need to be eliminated. POWERHOUSE MEGA uses a unique formula that controls odors for up to 30 days and uses a powerful odor counteractant fragrance and metazene molecular odor neutralizer. REMOVE PLUS+ Uratic Salt Remover safely removes uratic salt build-up in pipes while at the same time controlling offensive odors. REMOVE PLUS+ is a blend of special acids that also remove water scale build-up toilet bowls, urinals and all tile surfaces. REMOVE PLUS+ is safe on all plumbing, including PVC plastic and all metal. 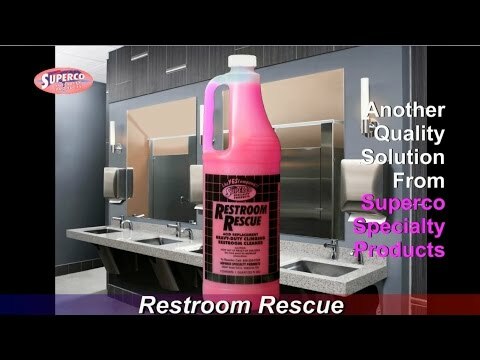 RESTROOM RESCUE is a clinging multi-surface restroom cleaning product designed for professional daily use. 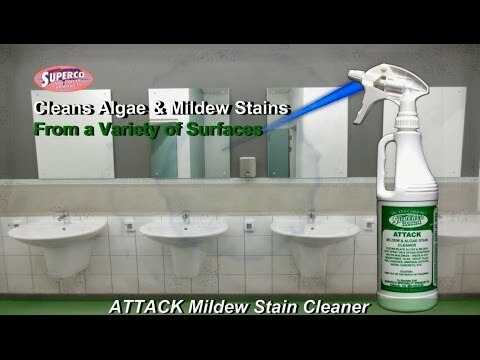 This product is specially formulated to remove soap scum and hard water stains from virtually all restroom surfaces. RESTROOM RESCUE has a thick consistency that clings to vertical surfaces and under toilet bowl rims. The pleasant fragrance deodorizes while it cleans. The multiple cleaning agents combine to give the extra cleaning power required for commercial applications. Can be diluted with water for economical daily use or used full strength for cleaning fixtures that were previously considered beyond repair. 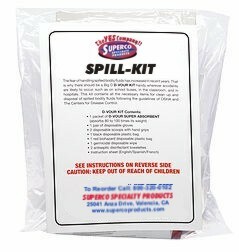 The SPILL KIT transforms a liquid spill into an odorless, semi-solid mass for disposal. 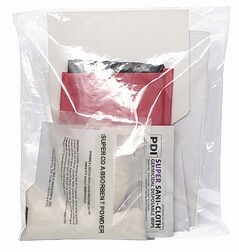 Effective for spills of blood, urine, feces, food and other malodor sources, this kit contains all the necessary items for clean up and disposal of spilled bodily fluids following the guidelines of OSHA and The Centers for Disease Control. SPLASH TRAPPER drastically reduces the splash back from the urinal and deodorizes the restroom. SPLASH TRAPPER will adjust to fit any urinal with its easy tear away perforations and suction cup application. This is the only product that also incorporates the unique color change feature upon urine and rinse contact. The SUPER 22 Hanging Toilet Bowl Deodorizer fits most toilets and deodorizes up to 1,500 flushes (30 days normal operation). The compound inside gradually dissolves, coloring the standing bowl water a fresh light blue color as it imparts a nice fragrance. Replace when the water is no longer colored. Blocks are non-para, acid-free, water soluble and 100% biodegradable. SUPER APPLE, SUPER ORANGE, SUPER LINEN BREEZE and SUPER PUMPKIN Non-Aerosol Super Concentrated Fragrances are perhaps the most effective and versatile odor counteractants on the market today. Made with Natural Fragrance Oils, this product is not only powerful but it is specifically formulated to last for several days after application. SUPER DEODORANT's unique ability to provide a pleasant fragrance for an extended period of time make it ideal for the areas with the worst odors. 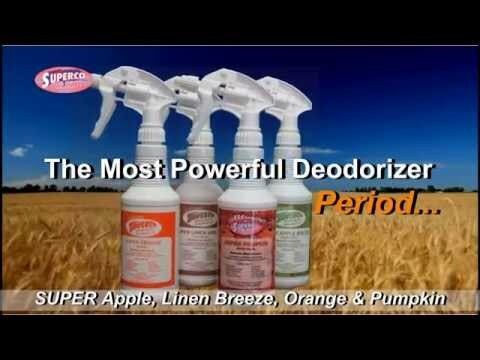 SUPER APPLE, ORANGE, LINEN BREEZE and PUMPKIN is the most powerful, most effective malodor counteractant available. SUPER BLUE Plus enzymatic toilet bowl cleaner cleans, deodorizes and leaves flush water with a blue tint. Each time the toilet is flushed, chemicals are released to eliminate soils, uric acid salts and scale build-up. 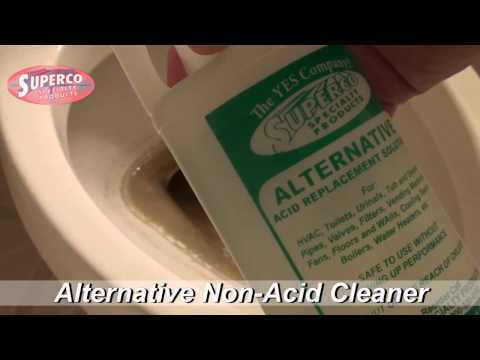 SUPER BLUE Plus fits into toilet reservoir, is safe for septic systems, and works well in hard or soft water. SUPER BLUE Plus is non-toxic, non-corrosive, chlorine-free and biodegradable. 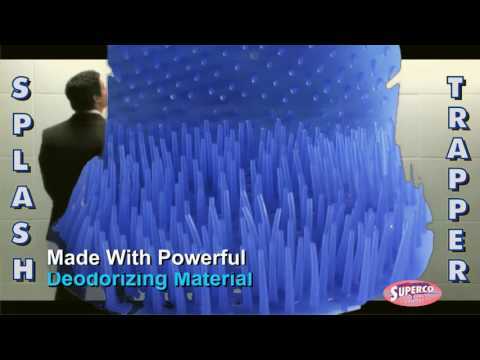 Superco's SUPER-FRESH HONEYCOMB Deodorizing System is the ideal solution to eliminating foul odors in restrooms, restaurants, office buildings, country clubs, weight rooms, anywhere bad odors exist. 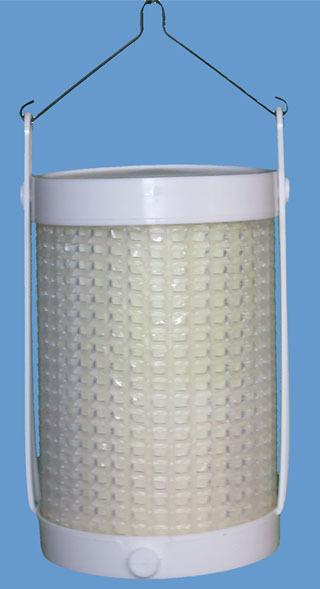 Upgrade the performance of your solid deodorizer system to SUPER-FRESH HONEYCOMB without changing your dispensers! 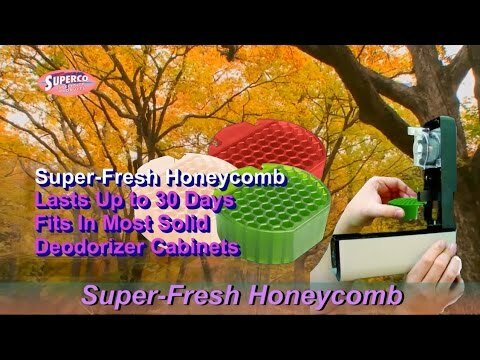 SUPER-FRESH HONEYCOMB comes in three terrific fragrances and fit into virtually any wall mounted solid dispenser cabinet and are effective for up to 45 days. Our automatic dispenser is triggered by room lights or sunlight and maximizes product life by only working when the room is lit or occupied. SUPER-FRESH HONEYCOMB has 15-35% more fragrance than current air freshening gels. 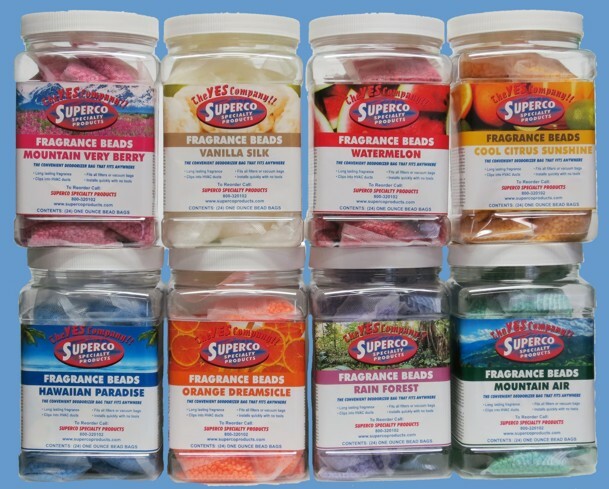 SUPER-FRESH HONEYCOMB is 100% recyclable and lasts longer than most any other air freshening gels on the market today. .
Superco's new air freshener technology is like none other. When the Super-Fresh US100 is made and the plastic is heated into a liquid, at that point the fragrance is added. The product then cools and the fragrance is impregnated into the screen. Super-Fresh US100 are excellent for eliminating foul odors associated with urinals. Super-Fresh US100 smell stronger with 10x more fragrance than traditional urinal screens. Super-Fresh US100 help reduce cleaning time due to a hundreds of "mini peaks" that reduce splash back, they last over 30 days. Super-Fresh US100 have a flexible design that allows the screen to mold to the shape of any urinal and have a pleasant eucalyptus fragrance. 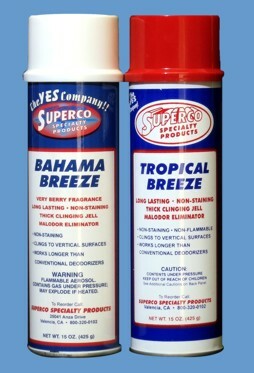 Superco’s Multi-Use Cleaner. Effortlessly rub wet Assistant across stubborn stains and marks and watch them miraculously disappear. The Assistant removes set-in dirt & grime from any hard surface. Removes water stains & soap scum from tile. Also cleans leather seats and vinyl furniture, etc. Ideal for detailing, shining, and restoring hard smooth surfaces. 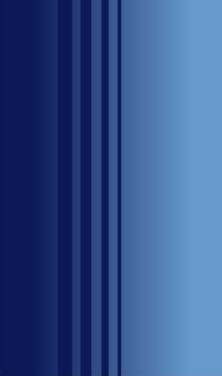 Also great on chrome, brass, copper, glass, plastic, vinyl, leather, appliances and much more. 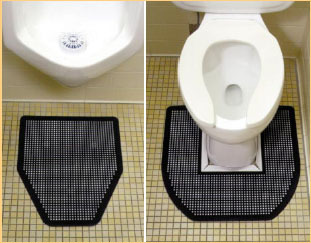 Superco's disposable urinal & commode floor mats will make restroom maintenance easier and faster. By placing them under urinals and toilets, unwanted splashes or drips are absorbed and the odors they cause are neutralized. They protect floor surfaces from stains, discoloration and damage caused by uric acid.